It is finally time, to show you my Bullet Journal setup for January! I have been using it for already two weeks now, which means I’m super duper late with this setup, but I can promise you, that it is effective, and I love it! This month, I decided to do the same topic as I did in January 2018: Galaxy! It was one of my favourite themes and I hope I will love mine as much as the old one (so far: I do!). I used my Tombow 623 for the coloured highlights. But unfortunately, this beauty is a bit to old and trattered for lettering, so I could just use it for as a background colour. Currently I’m experimenting with my new printer and my graphic tablet to create some stickers. This cover page is an attempt to print watercolours and I was surprised about the quality. It looks not exactly as the original, but it is very close and it is sticker paper it is way thinner than the watercolour paper. This year I wanted to start tracking my habits again. So, I made my monthly overview on one page and used the other side for six habits. The monthly overview is made as the one in December, because I really liked it and it is useful for busy times. 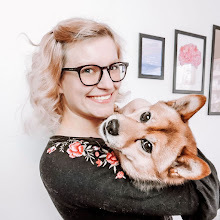 Because of new resolutions, I decided to track workouts, 2x simba (which means two dog walks a day), Pam früh (one workout from Pamela Reif in the morning), healthy eating, Clue (Using the app) and Instagram. For me this is a good mixture, to not overdo it with tracking but having everything I would not do if I would not have to make this little purple circle at the end of the day. For all the small monthly overviews on the weekly spreads and for the habit tracker, I used my new stamps. I love them even if they bleed through, but they don’t smear, and it looks so clean and simply. The first week of January was planned to be productive, but I got sick and did not really use my bullet journal during that time. But at least I managed to do everything that was already scheduled for this week and I sis not forget about my appointments. The little planets are stickers I made. As I said, I’m trying and learning how to paint digital. I’m not as satisfied as I wished but I like the look of then and so I can include a little watercolour on each page without making the paper any wet or wavy. This year I want to try out these “half pages”. I know that there is a more professional word for this, but I don’t remember it. What I did: I cut the right page, so that it is shorter than the others. I wanted to have my week one page as always and I made 8cm width on both sides for the days and the weekend on the bottom. On the back I have some information about my upcoming exams, which is very important but not enough for a whole page, and I track my expenses. What I like about this half page is, that I don’t have one whole page for this information and I can hide it if I want. On the page behind the half page I have another watercolour sticker with the quote “it is written in the starts”. Next time I will try to make the quote digital as well to highlight the worlds a little more. It is hard to read them now, but I love it anyway. Again, this is one week made on one and a half pages. This time I used a pinkish watercolour for the planets and I made four days on the left side and three on the right. This time I used the back side of the half page for another weekly spread. It was possible because I made the half page 12cm instead of 8cm. And this is it so far. By now I really loved the pages and I used my tracker every day, which I didn’t do for the last 6 months. My conclusion to the “half pages” is: I love it! I wouldn’t need any more space and I look the usefulness of it. What do you think about these pages? Would you feel bad, cutting your bullet journal or have you tried it before? Let me know in the comments below. I hope you like my design as much as I do. 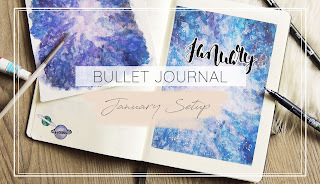 And If you can’t get enough, check out my 2019 bullet journal setup or my Instagram page.